You know the people who by all accounts should be able to do what they do, but stubbornly insist that they will succeed, flourish, and inspire? Yeah well Glenda Watson-Hyatt is one of those people. She rocks. Period. 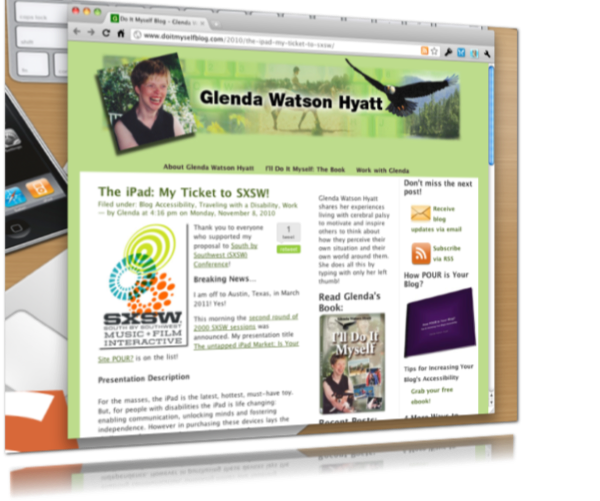 I’ve written about her before and how she discovered how the iPad opened up whole new worlds for her, well now I’m so stoked to say that Glenda has scored a coveted speaking slot at SXSW 2011. For the masses, the iPad is the latest, hottest, must-have toy. But, for people with disabilities the iPad is life changing: enabling communication, unlocking minds and fostering independence. However in purchasing these devices lays the challenge: oftentimes websites with product information are inaccessible to this market, which has a discretionary spending power of $175 billion in the United States alone. The session’s goals are to identify some barriers people with disabilities regularly face, making it difficult to participate fully online; explain the four guiding principles of what makes blogs and websites accessible; and offer key questions to begin asking and what resources exist to make sites more accessible to this under tapped market. By giving short vignettes of how people with disabilities are using iPads, faces are put to the size of this disability market – and putting faces to the need for web accessibility. This brings alive the technical requirements and guiding principles of web accessibility. Where do I start in making my website or blog accessible? On behalf of all of us in the Lower Mainland I want to say: Rock it Glenda! Read next: Custom-designed stand mixers. The coolest appliance you've seen all day.